New President- who was so efficient at keeping things on time! great Job, Liz! Many new members- Diane D. took them all under her loving wing! Extraordinary donations to Comfort Quilts and Raffle Baskets- Dianne K. took several trips with the little red wagon! Delicious sundaes from Cows Rock- Thanks Lyn! [Glad Maggie and I were seated in the back so got to be one of the first in line!] Ruth C and Sheila also know the benefits of last row seating! 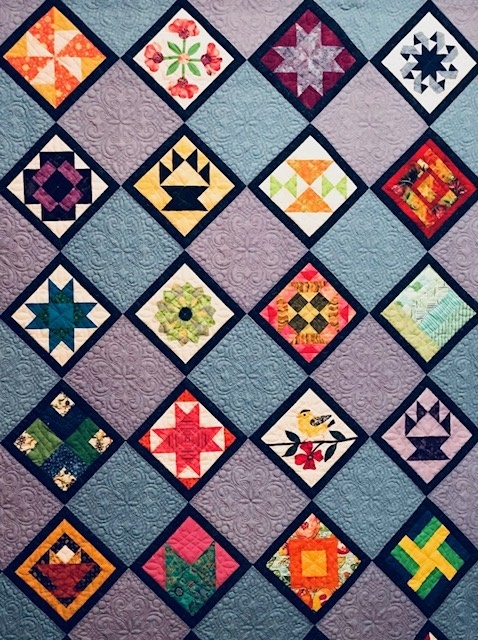 Absolutely stunning new Raffle Quilt- so many members should take credit! Show and Tell on a higher plane- great viewing! And then:Jane Hamel- Storyteller Extraordinaire – got me thinking I need to get to know the mailman better! Thanks to Ronni and her wonderful program and organizing skills!- Please someone step up to help her!!! Thank you, everyone, for helping to make my first night memorable and enjoyable!